A decade has gone by since I met her first, but it sounds like ten months to me. It should be same for her. Never know when we became so close to each other. Maybe in the second semester when we spoke for hours, all credits to Hutch! Or in the fourth when we had no secrets between us or maybe during the inplant training days? Don’t know when, but we are happy for whatever we were and we are now. I never called her by her name, and she did that ever. I never thought I will write again, and she did the trick and named this blog, “Few Miles” and I wrote again dedicating verses for her. So many never, ever and forever, I still remember the days I used to call her saying “I have written something new today!” and she read it the next moment. Many a times, I felt bad saying nobody reads my blog, but her words, “I’m sure someday you will have viewers from more than hundred countries! Touch wood!”, always boost my confidence. And you know what her words came true in 2012! Not just that, we have so many memories to cherish. Maybe I can write a book. Actually, she has done that and gifted it on my 21st birthday. Maybe, she realised that we may not spend more time after that. We did spent time after that too, but not like before, not 24×7, since life demanded us to work and concentrate on life and eventually, I moved to London and then to Germany, and she moved to Seoul, we kinda became busy with life, still our hearts knew that we were, we are, and we will be blood friends forever. No matter how many times we speak in a month or how frequent we meet, it is heart-to-heart connection. And it so happened today when I phoned her on the mobile phone and wished her “Happy Birthday!” She was happy to hear my voice and so I. We spoke only for few minutes, but the magic in her voice and the happiness in our heart is still the same. And that’s the beauty of true friendship, otherwise I will not write this one at quarter past twelve waking up from the sleep. 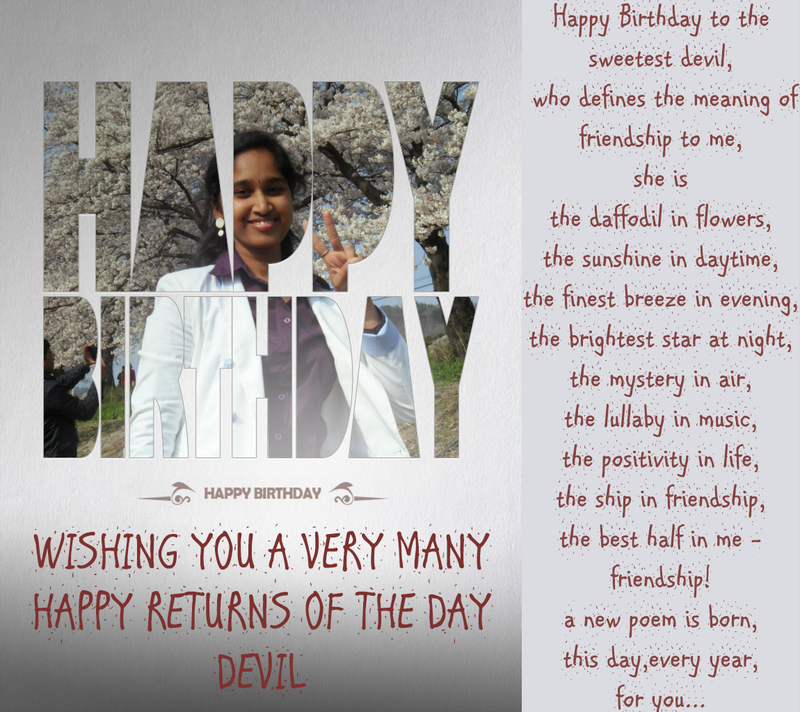 Happy Birthday once again Devil! And I made this card for her!